IT managers have long envied the power of all-flash storage for accelerating their most demanding workloads. Unfortunately, the much higher cost-per-terabyte for all-flash storage compared to traditional spinning disk storage has—in many cases—kept these ideas in the realm of wishful thinking. A data reduction technique called deduplication, however, is bringing all-flash storage into the realm of economic reality. As a recap of our previous blog article, How Deduplication and Compression Make All-Flash Storage Affordable. When deduplication is enabled, a flash array’s controller analyzes each write request (using a block size which is usually 4 kilobytes), checks to see if any of its existing data matches the write request, and if so, instead of writing the same data again, merely creates a pointer to it. By not writing multiple copies of the same data, deduplication saves storage space—and for certain applications, the savings can be considerable. 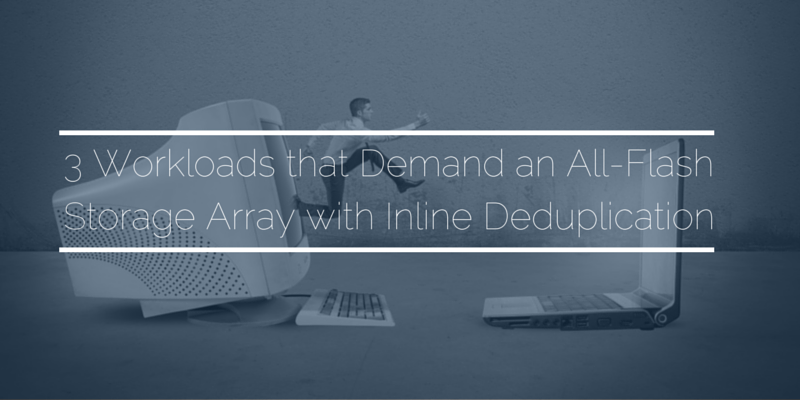 Deduplication rates of 1:10 are not unheard of (meaning, for example, a 7 terabyte array can perform at the same level as a 50-70 terabyte array). 1,000 virtual machines can consume a lot of capacity, but if they’re all running the same operating system, each instance of that operating system will be made up of largely identical blocks. With deduplication, each of those blocks need only be written once, cutting 1,000 duplicate blocks down to 1. This enables customers to consolidate these performance centric workloads which run your business on to a faster, denser, cost effective all flash storage platform. Furthermore, the need to diagnose storage bottlenecks caused by allocation issues or tiering solutions which are reactive in nature, is a thing of the past. In a virtual desktop environment, the deduplication scenario is similar to virtual machines. Most of the desktops will be the same, with the exception of each user’s individual data. So, most of the data blocks will only have to be written once. More importantly and maybe somewhat unexpected, is that Virtual Desktops are very difficult to support on a traditional array due to their highly transactional nature and write centric workload profile. This makes Virtual Desktops ideal for all flash solutions which can address the workload demands and provide a consistent user experience. We rely increasingly on databases to support our businesses. Whether the serve as the backend of your ERP solution, provide backend for analytics or are simply leveraged for reporting, performance is critical to these workloads. Flash can dramatically accelerate these workloads and we have seen 8x – 12x performance improvements with these workloads. Flash is an absolute game changer when it comes to accelerating performance centric databases and delivering immediate value to the business. If any of these applications are critical to your business, it might be time to learn about how to accelerate them with affordable all-flash storage arrays. A good place to start is our free white paper, “Making All-Flash a Reality: How to Bring the Power of All-Flash Storage Down to Earth.” Download it by clicking on the link below.